This project surrounds all technology that enables the trade of digital currencies as well as tools to simplify trading or execute advanced strategies. It includes a spectrum of features, from alerts and real-time quotes to the more advanced features such as automated trading and conditional orders. Those components are most important when considering a crypto-currency broker because the ability to execute a chosen strategy is highly important when trading. 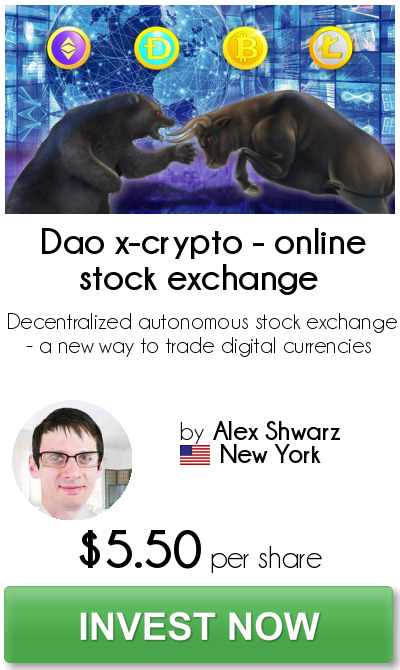 This stock exchange is developed for everyone who wants to simply buy and sell crypto-currency. Brokers can deposit funds using credit cards or bank transfer. Instant buy/sell of crypto-currency at fair price is guaranteed. We want this project to be a perfect marketplace for buying crypto-currency in a few clicks. Customers just create an account and deposit funds, after funds are successfully credited, customers can easily buy crypto-currency right away. Crypto-currency then can be kept on balance in a safe cold storage, traded, or be withdrawn to personal wallets at any moment. Buying crypto-currency with from bank account is very beneficial, especially for large amounts. Customers can upgrade account to next level and enjoy extra advantages. Stock exchange provides margin loans which are useful to increase market exposure and are low-cost, flexible way to borrow funds for trading financial strategy. Margin loans are risky transactions; however, they are effective way of working toward achieving investment goals like leverage assets to purchase more crypto-currencies than it would be able to buy on a cash-only basis. Application programming interface (API) brings powerful tools to implement the whole trading platform in custom software. Using this API customers can get ticker, order book, trades, etc. as well as performing trading operations like make orders, check balance, get history and more. It is good idea to invest in company where your capital will be used to fuel revenue growth. This project has identified cost-efficient marketing channels that bring more capital gain. Over the years, cryptocurrencies have displayed seesawing behaviour, reaching a peak, then crashing, then reaching another peak and crashing but gradually they are became a legitimate investment option. Moreover, many investors are seeing crypto-currencies as a haven asset, similar to gold. Unlike traditional currencies, which are affected by changes in their respective economies, crypto-currencies are not affected by changes in the field. Therefore, some traders use them as a hedging tool when their own currency is on the decline. The crypto-currency market cap has risen over $3 billion in one week, putting it at a current record high market cap of a most profitable investment target. We plan to conquer the 0.04% segment of the crypto-currency market, which will be about $24 billion to the end of this year. With our current average transaction fee 0.1% we expect to have about $1 million net income till the end of the first stage of funding of this project. In this case the annual reward per $1 (one dollar) investment will be about $25 (twenty five dollars). Investors are becoming part of community and entitled to vote, according to their portion, on any new submitted proposal, like project improvements or amount of rewards. Moreover they can take a job position like Regional Representative or Chat moderator or CEO or even can be elected to the board of directors. To become the market leader in crypto-currency stock exchange within five years. To become the lowest trade fee provider and drive an aggressive pricing model through the industry. To have the best and most responsive customer service. To allow brokers completely anonymous trading. As the popularity of crypto-currency continues to grow at an exponential rate, easy and affordable crypto-currency exchange is quickly becoming a necessity of life. Our project has mission to provide communities with the ability to trade crypto-currency with fastest and cheapest way and it will become the market leader in crypto-currency trading within five years. Marketing must generate new customers which will provide sufficient trading volume to drive an aggressive pricing model while still achieving planned profitability projections. To be able to adapt as market needs change. Keeping close contact with clients and establishing a well-functioning long-term relationship with them to generate repeat business and a perfect reputation. Developing the best in industry trading tools which will 100% satisfy traders. This decentralized autonomous organization belongs to all who made contributions into this project. The ownership percentage is calculated as amount of investment, made by a contributor, divided by the initial project cost. Once the start-up capital is collected, this project will then start operating according to its rules established in its smart contract. The primary buying factors in crypto-currency stock exchanges are price, accessibility, and ease of use. There is significant brand loyalty based on the company’s experience with its current customer base. Once an individual has acclimated to our stock exchange and memorized the access routine, he tends to be reluctant to switch to another service. Powerful branding and advertising, even with premium pricing, will create a significant barrier to competitors taking our customers. Being the market leader will strengthen the company’s branding position and also make it more difficult for the competition. The primary competition will be other well-branded crypto-currency stock exchanges, which have deep advertising pockets, feature-rich and competitive services, and an established brand. The marketplace is big enough to support all this competition and then some. The marketing, advertising and promotion strategy will rely heavily on online advertising based on paid ads and search engine optimization. Marketing specialists will organize focus groups to determine the best feature set and pricing. Our crypto-currency stock exchange will have the lowest cost structure in the industry, but premium pricing based on its uniquely rich feature set and quality service. The company will be the pricing leader and do whatever it takes to maintain this leadership. The DAO model of this project forces it to perform all corporate functions by community of investors and outsource some of tasks to skilled professionals. Only core team of key directions leaders receive monthly salaries while all other performers receive reward based on certain price. The amount of reward for particular job is subject to decide by board of directors or investors voting. This project seeks start-up equity financing to accelerate market penetration through massive online advertising campaign, hire additional sales, marketing, customer service and engineering personnel, and upgrade the operational hardware and software capability of the existing system. This capital investment will be sufficient to take the project to profitability and ongoing positive cash flow. Developing a software interface to make deposits and withdrawals through bank account. The total number of shares, which this project is authorized to issue is twenty-five thousand four hundred and seventy-nine (25,479), each with a par value of $3.00 USD.